The Quilt SOS project’s aim is to co-ordinate the sewing and donation of lots of beautiful quilts so that we can give every child in a selected SOS Children’s Village their very own handmade bedspread. The wonderful charity SOS Children’s Villages provides homes to orphaned or displaced children. Each child is looked after by a ‘mother’ in a home within the village. There are villages in 125 countries around the world; the charity works hard to ensure every child grows up in a loving family home so that they flourish and reach their full potential. 2019 will be our fourth year supporting SOS Children’s Villages. We have previously taken quilts to the children and “house mothers” in Hemeius (Romania), Vilnius (Lithuania), and Krasnik (Poland) – sending a total of 197 handcrafted, unique and cosy bedspreads which the recipients will treasure for years to come. 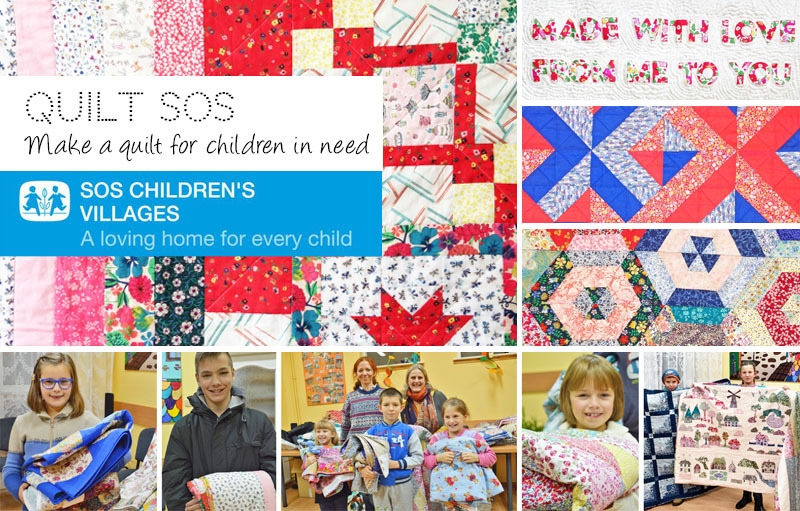 This year we will be taking quilts for all 60 children in the SOS Children’s Village in Islice, Latvia. We are hoping to hold an exhibition of some kind to showcase your beautiful quilts before we take them to Latvia. We will let you know as soon as we can, once we’ve secured a venue and date. All 2019 SOS quilts must be received by October 18th 2019. If we secure an exhibition space, there will be an earlier deadline for quilts which want to be exhibited. We are delighted to offer an electronic gift voucher of £30.00 value to any UK-based customer who makes their quilt with a Quilt SOS fat quarter pack (option 1 or 2 below). We are unable to guarantee a voucher for overseas quilters due to import charges that are often imposed when we receive a quilt from outside the UK. Please contact us before starting your quilt if you are not based in the UK, so we can find out the likely customs implications of receiving a quilt from your country. This year, there are four ways of sourcing the materials for your quilt. Make a single-size quilt using one of our Tana Quilt SOS fat quarter packs. Each pack includes enough Liberty Tana Lawn fabric for the quilt top, which you can mix in with your own binding and backing. There are many different packs to choose from. Send it to us including a submission form. After we receive your quilt we will send you a gift voucher for spending in our shop (on line or in person). Make a single-sized quilt using our Mixed Quilt SOS fat quarter pack of Liberty Tana Lawn and Quilting Cotton, mixed with Cotton+Steel quilting cotton. Each pack includes enough fabric for the quilt top, which you can mix in with your own binding and backing. Make a single-sized quilt with your own cotton fabric, either Liberty or other brands, as you wish. If purchasing fabric for your entire quilt top, you will need about 16 fat quarters from a 110cm wide bolt (e.g. Quilting Cotton), or 13 fat quarters from a 137cm wide bolt (e.g. Tana Lawn). Make a single sized quilt using a special bumper-sized pack of Liberty Quilt SOS small pieces (Tana and poplin) – each measures 7.5 by 5.5 inches and has a small sticker in the corner. These pieces are ideal for smaller patchwork designs. Use your own binding and backing. You can make more than one quilt if you like, and mix and match the different options above, just make sure each quilt includes its own submission form so that we can keep track of who has made what. You will need to meet the cost to post your quilt to us before the deadline. We recommend that you use a tracked and insured service for your peace of mind. In inches: width: 51 to 54″; length: 80 to 90″. In centimetres: width: 129 to 137cm; Length: 205cm to 228cm. The gift voucher code will be emailed to you within one week of receiving your finished quilt. It is valid for 12 months from the final submission deadline. To use it, shop on our site as normal, and enter the gift voucher code when you see “Have a gift card?” on the Shopping Cart page. You can use the voucher for full- or part-payment of a new order, including postage. We need quilts to suit a variety of ages and tastes. About half the children in the SOS Village in Islice are aged 10 and under, and half are 11 and over. About 40% are boys, and 60% are girls. The children loved receiving quilts last year which included a personalised message embroidered or printed on the corner, such as “made with love, from me in the UK to you in Poland”. One customer even translated their message into Polish! Take a look at my Pinterest board for inspiration about the quilt design. There is no need to pre-wash Liberty Tana Lawn or Quilting Cotton before sewing, but other fabric manufacturers, including Cotton+Steel, often recommend pre-washing their fabrics. It won’t do any harm to pre-wash all fabrics if you are making a mixed-brand fabric quilt top. Wadding can be purchased from your preferred supplier – we don’t sell it ourselves due to the impact on postage. One of our favourite brands of wadding, which has a nice “vintage” handle and drape, is Hobbs Heirloom. This is an 80% cotton, 20% polyester mix.